Microsoft released the next set of updates for its controversial operating system Windows 8.1. It’s ready to download now and here’s what you can expect. It’s nothing impressive, mainly a lot of security and bug fixes for the OS, Office, and firmware updates for Surface tablets. Earlier it was speculated that this update would include a new Start menu that combines aspects of the new Modern UI and the traditional Start menu, but Microsoft decided to scrap that, and it will presumably be available in the next version of Windows, codenamed “Threshold” which is said to be launched early next year. If you have Windows set to automatically update, which is the default, you should be prompted to restart in the next couple of days. 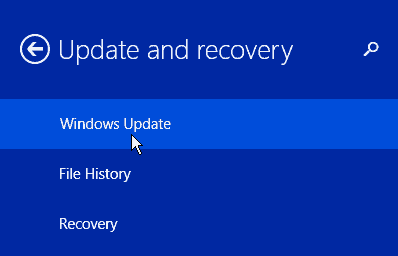 If you want it right away, go to PC Settings > Update and Recovery > Windows Update and install the updates. If you’re getting an error, make sure to check our article: How to fix Windows Update not working. Brian, do you have any further information about the issues reported by users of Win 8.1 after installing the August updates? So far on my laptop all seems to be going well…fingers crossed!! @Ziggy: I haven’t had any problems at all and have installed it on four different Windows 8.1 machines…Desktops, Laptops, and a tablet. Thanks for your reply, Brian.That’s re-assuring, knowing that 4 of your pc’s have not been affected. So far no problems on my laptop running Win 8.1 either. Would be interested to hear what other people have to say and if they’re experiencing any problems with these August updates. Also, from what I understand with everything, it affects Windows 7 Home Premium the most. So, it’s worth mentioning that I have installed the latest updates on one of my Win 7 Home Premium machines as well as a couple of Win 7 VMs … Ultimate and Home Premium and have had no issues on those either. Same here, Brian! No problems with my two Win 7 Home Premium, 64 bit, machines. I just don’t get it but from what I understand it’s got to do with the font cache in system 32 and update kb2982791 as well as kb2970228. According to Softpedia, Microsoft is working on a fix. I’d be spitting bricks and chips if M/S’s supposed fix does damage to a machine that ain’t broke yet. When, oh when, will M/Soft get it right and lose the the tag of black Tuesday? Yeah, from what I’ve read it has to do with those updates you mention and the font cache system too. Microsoft is going to be on a monthly rapid release cycle for Windows 8.x and the up coming Windows 9 “Threshold” which is said to be coming out April of next year. If anyone does get the dreaded BSOD after installing the updates, I would think you’d be able to go into Safe Mode and rollback the updates in question. Microsoft pulled the updates, and currently they haven’t said anything about when they will be made available again. With this new aggressive rapid update release cycle, you can expect there to be some snags along the way. But overall, I think these types of botched updates are a low percentage overall considering the huge amount of updates release by Microsoft over the years. That is one reason I set Windows to automatically download the updates, but not install them. I usually wait a few days before manually installing them to see if there are any issues – especially for Optional updates. I think more Windows 7 users had some problems though. Thanks for that link, Brian. My Win 7 Home Premium 64 bit is still behaving (as is my Win 8.1) so I must fall into the 99.99% not affected.